Day one and we were SO excited. We were not even sure what we were excited for or how long that excitement would last. A plan on the brink of unfolding is exciting! It’s also emotionally overwhelming. But when God directs, you follow. We’re human with our bits of nervousness too. I just wanted to hug him so tight right off the plane, but knew that probably wasn’t the best idea. The double doors at the international arrivals gate opened approximately 176 times and not one time did our host kid walk through it… until the 177th time. When that door opened, time stood still for a second. Then he looked at us, he smiled that shy smile and then he looked down. Eventually he walked over to us and my husband asked, “How are you?” Our host son surprised us by responding, “I’m fine.” Hold UP, this kid speaks English? We snapped the required arrivals photo and left. Just like that. It’s a bit like leaving the hospital for the first time with a newborn. We had this kid who we knew virtually nothing about, who we weren’t even sure could carry a conversation and people had trusted us to walk out of an airport with him and return 4 weeks later. That’s mind blowing y’all. A few stops and then we were home. We showed him his bed and his things. We noticed him limping a little at the airport so, once home, he took off his shoes. We saw two large blisters, one on each foot. The boy with blisters on both feet, who brought US a gift and was exhausted was finally here and about to go to sleep IN OUR HOUSE. Arrivals day wrap up… mind blown. That is all. Weeks passed and love grew. Late night talks, daytime tickles, giggling, grinning and 42 hot dogs later we fell in love and we fell hard. We talked about God and that he created the world. Later on, I asked him if he’d heard of Jesus. “What’s Jesus,” he said. I explained He was God’s son. He then said, “What’s a son?” I explained that our boy was my husband’s son. He understood. I explained that we believe Jesus is God’s son that He sent to the earth for us. Of course he asked why. Here we go, try to keep it together. Again, our conversations were basic because of his age and I’m no theologian and he’s still learning English. I did my best to explain that GOD is GOD and can do ANYTHING therefore he allowed Jesus to die for US but then come back to life again and we believe that we must ask Jesus into our heart. I think he understood. The next day, while waiting in the car to pick up a prescription, he said from the backseat, “Mother I’m ask Jesus in my heart.” That is why we did this, to share the love of Christ with a child. While sharing OUR love with our host son, God put a new hope in him. 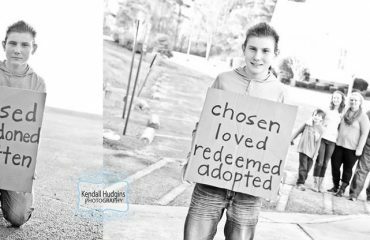 I am prayerful for his little heart, that he truly understood his decision and that he grows to love Jesus and share that love with others. As Matt and I headed out to the parking lot, we cried. For a moment I wondered if it was right to do this. But, to not do it so that they wouldn’t hurt is to allow these children to possibly never feel love. Love is heavy. It’s heavy when it feels good and it’s heavy when it leaves our body dripping down our cheeks. Love is heavy. We love because He first loved us (1 John 4:19) God is not done here.